Come by this week to see Stephanie Peek‘s “Uniform Language” one last time! 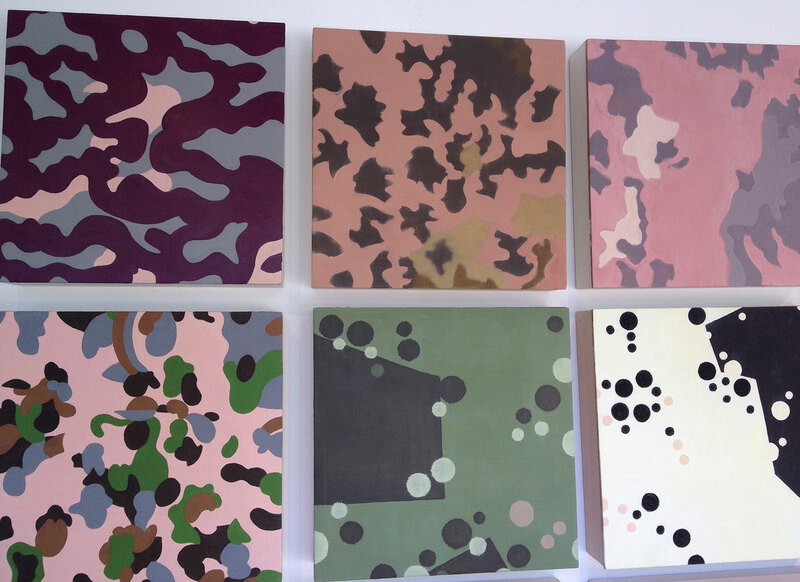 This group of square paintings uses camouflage patterns from around the world as inspiration. Peek adapts the patterns, altering scale and color to create abstract imagery that looks familiar and yet strikingly unusual. Installed in a series, they create a larger patchworked composition that help us to compare and contrast the many approaches to concealment our armies employ. Each environment is unique, and each culture has its own tactic for disguise. In looking at the patterns of countries where the U.S. military is deployed, Peek hopes to find some human connection, some understanding of their environment, and to propose the possibility of turning a symbol of war into one of beauty and peace. Read more about this series on our exhibition page.